Powder coatings are applied as a free-flowing, dry powder and are typically applied electrostatically then cured under heat to form a “skin” or hard finish that is tougher than conventional paint. Washer/dryer shells and motor casings, refrigerators, refrigerator shelving and motor casings, faucets, sinks and small appliances. Lawn and garden tools, mowers, edgers, and patio furniture. Computer hardware, office furniture, filing cabinets, storage and display shelves, warehouse racks, and lighting fixtures. Agricultural mowers, irrigation equipment, tillers, and construction equipment. Rebar and steel cable, columns, water treatment facilities, HVAC units, gas and oil transmission lines, windows, sliding doors, canopies, and architectural decoration. Truck and trailer wheels, mirrors, supports, frames, steering wheels, wipers, springs, shocks, and other miscellaneous auto parts. The demand for powder coatings is seeing rapid growth, driven by the development of new materials, formulations, equipment, and applications advancements. Powder coatings are tough, look great, and last a long time. In addition to being durable, powder coating is an attractive choice due to environmental advantages. TCI Powder Coatings provides dependable, efficient service and carries a wide selection of superior products used for innovative solutions and applications within the architectural, furniture, automotive, agriculture, and construction markets. Selecting the best colors for your project is easy with our TruSelector Chip Program, which equips you with the necessary samples to find the ideal color for your project. Our Color Chip Program offers an accurate representation of color, texture, and gloss by supplying you with 2”x3” chips coated in more than 300 of the most popular colors from our extensive portfolio of powder coatings. All the chips are created according to our quality control process to ensure the powders are applied at the recommended film build and meet our quality appearance specifications before being placed into inventory and released for shipment. 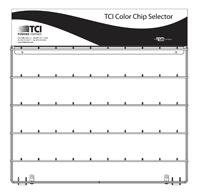 To further enhance the usability of the Color Chip Selector, we offer a wall-mounted display system so you can quickly and easily access your chips. 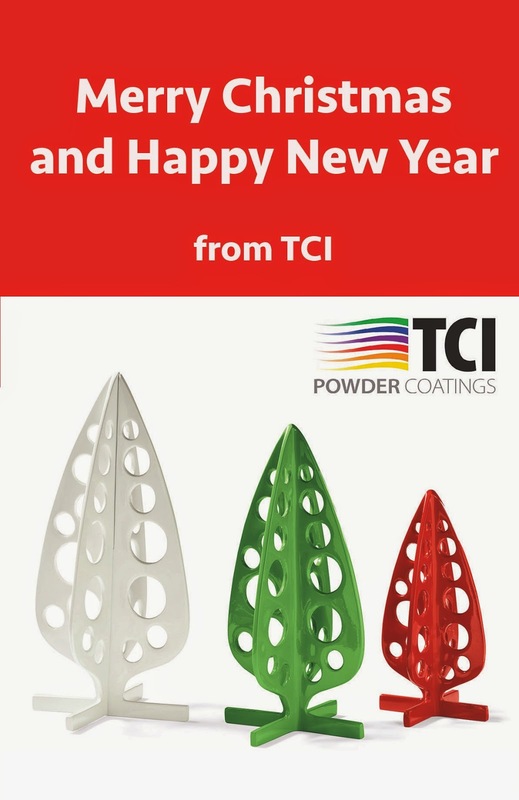 For more information contact TCI Powder Coatings’ Chip Program at tcichip@tcipowder.com or click here. 2000 Series AcrylicSystems: TCI offers an extensive line of high performance acrylic powder coatings, which meet many decorative application requirements. The 2000 series is available in many colors and finishes, including clear coats. The 2000 series has a broad formulation range and products in this series can have increased hardness, chemical resistance, overbake resistance, and weatherability when compared to standard systems. This line can be ideal for both indoor and outdoor applications and is commonly used in the automotive industry. Dry coatings can be dated back to 1000 B. C., with porcelain and other vitreous enamels among the earliest of dry coatings. Porcelain was used extensively on cast iron in the mid 19th century. 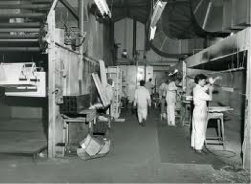 By the 1950s, the first organic coating, thermoplastic vinyl, was being applied with a fluidized bed. A German scientist, Dr. Erwin Gemmer, developed the fluidized bed application for thermoplastic resins on metal as a more productive alternative to flame spraying, in which melted (or heated) materials are sprayed onto a surface. From 1958 to 1965, almost all powder coatings were applied with the fluidized bed process. The thick applications were primarily used for electrical instillation, as well as abrasion and corrosion resistant purposes. The technology and application methods of powder coatings continued to evolve when France introduced the first commercial application of epoxies in 1962 and in 1968 when spray applications appear in Europe. By the early 1980s a thinner, smoother film coating and economical advantages lead to considerable growth in the use of electrostatic coatings. In response to environmental pressures and demand from several major markets, powder coatings will continue to replace liquid finishing as the coatings and application advance. As a professional powder coater, it is critical that you have a supplier you can trust and rely upon. Powder coating is a dry finishing process that has become extremely popular in the industrial finishing market, and is used on a wide array of products. More and more companies specify powder coatings for a high quality, durable finish, allowing for maximized production, improved efficiencies, and simplified environmental compliance. Used as protective and decorative finishes, powder coatings are available in an almost limitless range of colors and textures, and technological advancements have resulted in excellent performance properties. So what's in a powder coating? Resin – either polyester or epoxy. 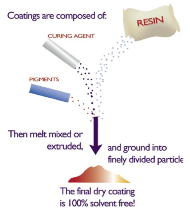 Curing agents – added to bind the coating. For polyesters, primid curing agents are used. For epoxies, dicyandiamide curing agents are used. Additives – give the powder a desired effect. Tint pigments – there are two types: inorganic, which are generally pale and dull; and organic, which are more brightly colored. 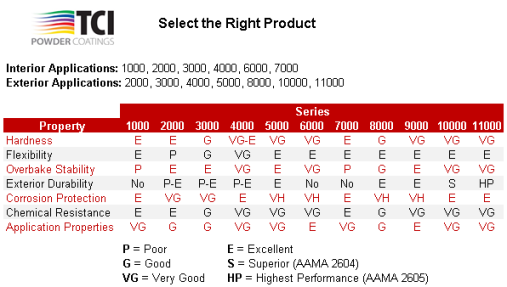 See the chart below to help select the right powder coatings for your application. Need personalized help selecting the right product? Click here to contact us and we'll guide you through choosing the best product for your application. Q: Can brass can be powder coated successfully? Also, can you powder coat over rust, or must it be removed or treated first? A: Yes, you can powder coat over brass. However, its surface is soft and porous, and, therefore, hard to get completely clean. The best way to clean brass is with an ultrasonic system, where mechanical agitation helps work the soils out of the pores more effectively than typical spray systems. The material may outgas and create some pinholes if it is not perfectly clean. To help avoid outgassing, the coating should be cured at a temperature in the lower end of the cure curve. Rust can be initially hidden by powder, but it is not a good idea. Rust under a coating will set up a low-pressure zone, and moisture can easily penetrate the coating and be absorbed by the rust. The additional moisture will cause more corrosion, the coating will swell, and it will break off the surface. Rust instead should be removed, unless you have no expectation or need for the coating to last for any appreciable length of time. We have made some updates to the TruCoater Network in order to benefit more customers. We are excited about simplifying the program and giving the chance for all our customers to benefit form the program. There will now be three levels: Basic, Premier, and Elite with no annual membership fee for any of them. Our hope with the TruCoater program is that it brings great information exchange in the industry, connections with Alliance Partner companies, and benefits for your company in connecting closer with TCI. For more details on the updates, please click here to download our updated TruCoater brochure. Make sure you are taking advantage of all the benefits of being in the TruCoater Network. We are pleased to announce a few important recent promotions and hiring of new TCI staff to positions that will position the company to keep it’s commitment to unparalleled services and focus on the core markets where powder coatings powders are being utilized. Steve Jones has been promoted to Director, National Markets. He comes to his position with over 40 years of experience in the coatings industry and extensive knowledge of powder coatings. 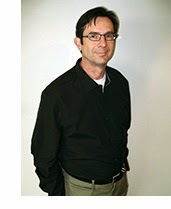 His work in the past 14 years has been in powder coatings, working with both DuPont and TCI. In this new role, Steve Jones will direct the programs supporting TCI’s sales efforts throughout North America. The programs include directing marketing and branding, the TruCoater Network, website utilization, and architectural segment development. Jeff Wilhelm has been promoted from within to the position of Director of Technical Support. In his new position, he will be responsible for planning and directing TCI’s technical support to customers in the field and providing the support needed to demonstrate the effectiveness of TCI products and solutions for new potential customers. Mike Webb has been hired back to TCI as the Senior Technical Representative. He brings 30 years of great experience in the coatings industry to his new position and will be a great asset to the technical department. TCI recently exhibited at the 2014 Fabtech Show in conjunction with DuPont™ Teflon® industrial Coatings under the umbrella of the TruCoater Network. We are excited about this successful event, and the manufacturing industry is quite alive and doing well. Fabtech is the largest metal forming, fabricating, welding, and finishing event in North America. Over 27,000 attendees and 1,400 exhibitors came together under one roof. Visitors were able to experience live equipment demonstrations, learn cost saving solutions, and network with industry peers. The event also held over 100 educational sessions and expert-led presentations on the latest industry trends and technology in the metal forming, fabricating, welding, and finishing industries. We were so impressed with the show that we already committed to attending Fabtech 2015, November 9-12 in Chicago, IL. We encourage you to plan this in your schedule for 2015. Fabtech provides a convenient “one stop shop” venue where you can meet with world-class suppliers, see the latest industry products and developments, and find the tools to improve productivity, increase profits, and discover new solutions to all of your metal forming, fabricating, welding, and finishing needs. We hope to see you there!